Historically I have used the month of December to pause and relect on the previous year. I invite you to join along. Carve out a few moments to consider this question. I highly recommend writing your answers down. Maybe read the question at the start of the day and write your thoughts before retiring for the night. Do all or do some. 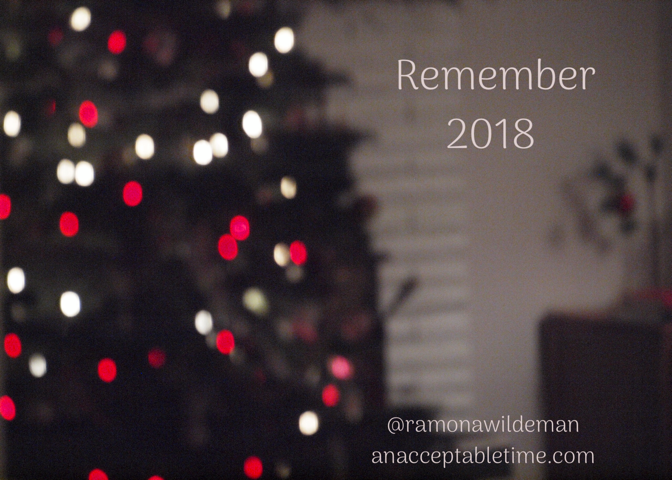 If you are on instagram we can use #remember2018 or go ahead and tag me @ramonawildeman if you want to share your thoughts. What was your best trip of 2018? Was it big holiday? Maybe it was a short commute? Who was with you? Why did you go? Where did you go? Best trip was definitely our trip to Ucluelet and the Kootenays of BC. We love it there and we will get there eventually when it is time to leave the lower mainland. I took 2 weeks off from my day job – one week is nice, two is better, three is the best. I was delighted to have two consecutive weeks off. We spent a good portion with the time reconnecting with our good friends whom we have not seen for any length of time since we travelled together to the Maritimes. The first few days on the island were clear and smoke free. The rest of the trip we were surrounded by the smoke of the forest fires. Our intention was to get a feel for the place and check out a piece of property. Which we did and which we loved. We finished the trip with a couple of days in Nelson.